Here's what you need to know! We've got a LOT going on behind-the-scenes and right in your faces (or monitors)! Here's a information breakdown of what we're working on, what we're planning, and what we've got lined up for the soon-to-be-present. Think you can hit the Target's Bullseye with this powerful polearm? 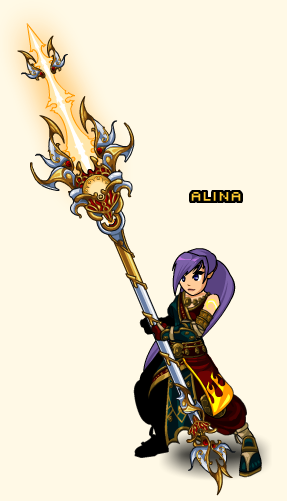 If you don't have a Target store nearby, you can ALSO pick up the Bullseye Spear at Valencia's AC shop in /battleontown for 2,000 ACs! Valencia will only keep the Spear in stock while the promotional item is available at Target! * Follow the steps listed here to unlock your Bullseye Spear, but you'll look for the Bullseye achievement in your Book of Lore instead of the Flamestop. Lorelympics Limited-Time Shop Opens Today! Having a goal is important in life, whether it's to win a Gold Medal in a sports competition or to get that shiny gear before the shop leaves! To celebrate the competitive spirit and working hard to achieve your dreams, we're opening the Lorelympics Shop! 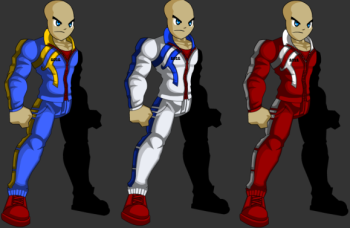 It will be stocked with sports-themed gear: color-customizable Track Suits (3 colors to choose. Why not use your country's flag colors? ), Gymnastics outfits, a Lorelympics Flame Mace, the PvP Medals, and more! Female Gymnast armors will sparkle. The Male armor will not. The Lorelympics Shop is in Battleon now, and will stay for a week! More gear will be added to the shop on Monday! Dage vs Nulgath War Finale this Week! Gear in the Winner's Shop. Both Nulgath and Dage the Evil have promised epic items should their sides win. Do not let your commander down! What stays after the war ends? We've mentioned this in previous Design Notes, but we get thousands of new players each month, and new news is better than old news, even if it's the same news. ** These have not been decided yet. Let us know which you'd like to remain available! AE will never offer mod-ship over Twitter/Facebook! We have been getting a lot of reports recently about players being offered mod powers if they pay money/give account info/cluck like a chicken over Twitter and Facebook. Please remember: We will NEVER ask you to pay us or give us your personal information to become an in-game moderator, developer, or admin. The ONLY people who have the power to offer those positions will email you using an @battleon.com email address, and we will never do it over Twitter or Facebook. Note: We will also NEVER ask for your passwords, phone number, credit card infomation, etc. We don't need those things to help you or give you mod powers. The Dark Caster Class is in development and will release as soon as its ready. Please remember, the ONLY people who will be able to access this class are players who bought the Dark Caster Armor from Dage the Evil's 2011 Birthday shop. The Dark Caster X armor (bought from the Dage War Preparation shop) does NOT give you access to the Dark Caster Class. The class was promised to those who bought the original Dark Caster Armor. Artix can't keep a secret! New swag coming! If you're keeping an eye on the Artix.com Design Notes, where Artix shares news about AE and the new AQ3D: Legends of Lore game we are developing, you might have noticed him spilling the beans about a few projects we've got going on. Some of you have been asking about them, so here's what's in the works. 2013 AE Calendar! So epic we can't even BEGIN to describe what's going to fill it! AQWorlds artbook! It's finally underway, and has moved into the Artix-Changes-Everything Polish stage. Mido has been going all-out on the book, and it's looking fantastic! Reens, the Lead In-game Moderator for AQWorlds and HeroSmash, levels up today in real life! We wish her much cake, many presents, and a LOT of peace and quiet. If you want to give her a present, why not go in-game and help a new player battle that boss they're having trouble with? Happy birthday from your Artix Entertainment family, Reens! PS: Members: It's August 1st! Make sure to visit Twilly to get your two FREE treasure chest keys! Online Interations not rated by ESRB. Copyright (©) 2008 - 2018 Artix Entertainment, LLC. All games and characters are trademarks of Artix Entertainment, LLC. All Rights Reserved. Copyright (©) 2008 - 2015 Artix Entertainment, LLC.